Sen. Cory Booker has promised to “bring a fight” to the National Rifle Association if he’s elected president in 2020. Speaking during a CNN town hall Wednesday night, the New Jersey Democrat told a mother who said she’s afraid to send her daughter to school for fear of mass shooters that he plans to take on the gun lobby and crack down on gun purchases. 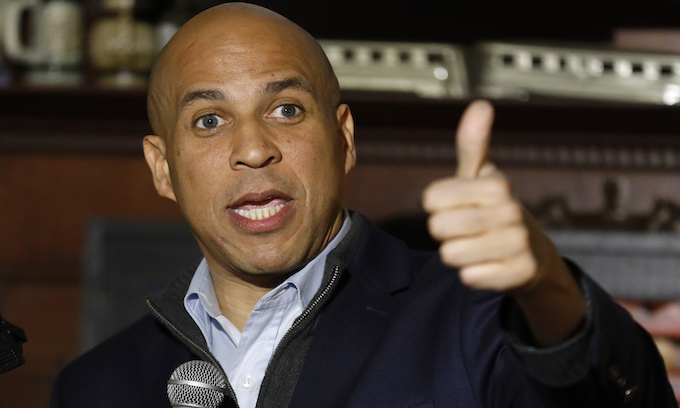 Mr. Booker said he supports tightening restrictions on gun purchases in the country, including universal background checks and closing loopholes on private sales. “I’m a black man and black males are 6 percent of the nation’s population, but they make up the majority of homicide victims in this country,” he said. “I am tired of going to funerals where parents are burying their children. NRA spokeswoman Dana Loesch responded to Mr. Booker’s comments in a pair of tweets Thursday morning, claiming that “not a word” he said was true. Another point here — what does “The NRA has to go” even mean? This is a group of several million law-abiding Americans, Senator. You want to stifle our speech? Our assembly? Please explain. Hmmm I wonder who it is that are shooting that 6 % Cory. I’ve got five bucks that says that it is not NRA members or could it be the unspoken, barely under the surface implication that it’s WHITE men and /or the PO lice. Stick to some other talking point for your sure to be short Presidential campaign, Spartacus. Bring it on cue ball. If you idiots really cared you wouldn’t have laws that you arbitrarily decide whether to enforce or not. Which ever advances your twisted narrative seems to be the only criteria. I’m an NRA Life Member and a retired military man. Are you going to come after me? That’s what the NRA is you nitwit. It’s comprised of everyday American citizens, of all walks of life. Not a bunch of jack booted thugs as you and your ilk try to portray us. Pictured above…holding up his trigger finger. Unlike, say Antifa, BLM and the weaponized FBI/IRS/DOIJ that obama turned them into.. He needs to start with eliminating the “catch and release” programs for black perpetrators in Chicago, Baltimore, New Orleans, and parts of Los Angles. That would cause an immediate drop in the rate of blacks being shot. We can fence off a few thousand acres in southern AZ and hire Sheriff Arpaio to create a large tent city to house them. Wait for their hearing in the ‘bare minimum’ facilities of TEN CITY, or GO HOME WILLINGLY the same way they came. NO MORE ‘catch and release’. Catch and ship to Joe! Or, we could go back to SWIFT and sure punishment of public executions for those perps who murder, or get caught doing a crime with a gun.. These senators, congressmen/women are not a thinking bunch. There are probably as many Democrat gun owners as Republicans. Why would they do this to their own party? Like always, they feel they are above laws they press for, that they demand the rest of us follow. Well said 440volt. Booker is convinced that his attempts to take away the guns Republicans and Democrats hold sacred would work. Does he really think we will just roll over. Most of us are veterans and very many are war veterans. Do you really think that patriotic Americans won’t fight for their country? Should you become POTUS which is just as unlikely as me becoming POTUS, you will find yourself and liberalism in a battle you’ll never win. OK… so this jackass is going to bring a knife to a gun fight? Ahhh hhhaaa ha ha… making a beer run and putting the popcorn in the ole’ nucer! Just more red meat for the frothing at the mouth democraps, from a clueless imbecile, who has as much chance of being nominated as a goldfish. I actually HOPE he gets the nomination. Well over 100 MILLION Law Abiding Gun owners (Thanks obama!) a large number of which vote democrat because that’s the way they were raised. EYES are opening, and looking at what Grandpa shot at in WWII playing pretend politics. With how many others are running for the commucrat nod, i don’t see booker making it to the top 5, let alone getting the nod. I beg to differ… this Spartacus moron is way stupid and useless. Ituser… He’s got to be a major contender! @baitfish. They thought that about Trump too. Let’s not underestimate the chances of him getting nominated. I am hoping that the huge number of idiots running against Trump will water down the field and cause them to do damage to one another to the point that people recognize the idiocy. Cory reminds me of Curly and Shemp 3 stooges replacement Joe. Not to belittle your statement but by comparing this jerk to Curly and Shemp it is belittling and offensive to Curly and Shemp. Go after the criminals. Enforcement of the too many laws already in place will stop a lot of the violence. Stop all the illegal immigration that is happening and deport those already here. I read almost every day where an illegal is killing someone or is breaking some other law. That’s exactly what we need. NOT yet more thousands of pages of laws. BUT ENFORCEMENT of the ones we already have..
Booker is a FARCE, move along, there’s absolutely NOTHING here to see! MOLON LABE!!! Just another Unhinged Lunatic. What does the Democrat Party stand for? Jussie Smollett is their poster child. The problem with men like Booker is they can only think of one solution to a what they consider a problem and that is taking away the guns from everyone even the innocent people that just want to have the right to protect themselves. Besides Booker is not one to lecture me on how to be a good person. Stay in your lane bro or we’ll run over yourass. News flash Booger, you’re not Black, barely brown. Is Corey Booker really so deluded and clueless as to think that going after the NRA will have any effect on the black homicide rate and in reality does he even care? Or, is he merely regurgitating democratic propaganda to hide his true intention of denying law abiding citizens their second amendment rights? in truth the democrats care not at all about the plight of minorities in our inner cities. In fact they depend on it. Keeping minorities poor, uneducated and afraid is a cornerstone of their strategy in what has become a pathetic attempt to maintain their base. Similarly, demonizing the NRA is just another way for democrats to try and garner votes from those equally ignorant who have been brain washed to think that “gun violence” is linked to the NRA. “Gun violence” is not even a real term. Guns are not violent. Criminals are violent! It never ceases to amaze me, how these gun grabbing liberals never promote a bill going after criminals, but rather always target law abiding gun owners. If that woman who fears for her daughters safety thinks that the answer lies in more gun control she is sadly mistaken. Her daughter will only be safe when a well regulated militia being necessary to the security of a free state stands ready to defend her and all of us against the tyranny of evil men, both criminal and political alike, Corey Booker not withstanding. Cory, Your pals BHO and Holder already tried to ruin the NRA and perfect GUN Control with their Fast & Furious incident. They screwed it up and their gun propaganda never fully evolved. ASK, BHO to read the files. I sure would like to read them. IMO its a mix of the 2. Ituser…Good point. Agreed. Since both propositions are true I guess phrasing it in the form of a question is rhetorical. Cory Booker is a jerk. He is yet another black-privilege-affirmative-action (Stanford, Rhodes Scholar, Yale Law) freeloader not only ready to bite the hand that feeds him but destroy the source of his meals. I don’t know about anyone else, but I am getting sick of these Privileged Blacks and Privileged First Generation (anchor babies) Americans along with the foreign nationals on their staffs grabbing the microphone and taking the spotlight with an undeserved sense of entitlement. If you don’t have a valid platform and you hate America, go for the guns, idiots. My impression is that they are enemies of the state and guilty of sedition. Wish we had a DOJ who would prosecute them as such. BTW, Cory, it’s not the guns, its the lack of fathers teaching moral principles in the home that is at the root of these problems. If I could vote you up by 100 stars, I would. Bring it on, you racist piece of trash. Meaning cory snot booger , I hope. He fits my description. Sexual predator and the press keeps trying to over look the accusation of his sexual assault of a man in the men’s toilet. Don’t forget to outlaw cars too, for there are Way More auto accidents, and auto deaths than shootings. And how about airplanes, knives, fists, swimming pools, baseball bats? Maybe we need to just Lock up every person on the planet so that no one can hurt another, and we definitely need to lock up the Liberals, for they are the Most Hateful, violent, in the country, and are the ones who make all the threats against conservatives, even death threats, against Trump and his supporters.. So why do they want to Single out Guns, and Not also autos, planes, knives, swimming pools, bats, fists? It’s about Control of you, Not about lives..
First of all you have NO chance of even making it to the primary. Second, you are a racist anti-American bigot trying to capitalize on your racism and we do not accept that – you are a privileged person who has 90% more privilege than the rest of Americans. Third, there is this “thing” called the Constitution that allows ALL law abiding US Citizens to own whatever guns they choose, without ANY government interference. Get used to it as it is the Supreme Law of the Land and our US Supreme Court will insure you and your liberal socialist terrorists do not interfere! Fourth, the NRA is the oldest and foremost Civil Rights Organization in America! We protect the rights of All American Citizens. We provide the best gun safety in America. We have more voters on our side than any opposition. We protect America from criminals, gang members, illegal aliens and terrorists! We support gun laws and enforcement of gun laws. We are the NRA and we are AMERICA! This type of language from liberal Democrats should not surprise anyone. They will demonize any person or group that does not agree with them. They want desperately to remove the 1st and 2nd Amendments from our Constitution. The liberal Democrats have moved so far left as to pose a threat to the very Constitution that makes this Country great. We must stand up and fight against this tyranny! Corey – try being rational instead of spouting your far-left ideology. Do you know that abortion kills approximately 100 babies every hour, of every day, of every week, of every month, of every year? Or you just don’t care? Fix that problem – or will it cost the Democrats too much $$$ in campaign contributions from Planned Parenthood? While you’re pandering to people who don’t think for themselves, you’re spouting BS. You are remarkably similar to Obama – all talk, no common sense. And, based on your history of assaulting a man in the bathroom and distributing confidential material in a Senate hearing, you’re a criminal just like Obama. Being rational, is against libtards rules..
Booker is another politician that thinks saying it makes it so! What a FOOL. The chance of him becoming a national political power is ZERO! Becoming a CLOWN, very high! Having grown up in the area it was a good industrialist city in the 60’s. Liberal politicians like Fartacus took over and it went down hill quickly. Look at the demographics of the area and the reason is obvious. The NRA which I have been a member of since the early 70’s is an organization of millions of law abiding citizens with a common appreciation for the shooting sports and their constitutional right to posses a firearm for multiple uses. I’m sure Corey (fartacus) and most of the other Dems would like to see that pesky constitution dissolved as well. NO! You have NEVER served your country and being a lying politician is not service. A self serving demagogue seeking to sit in an office of power by stirring up the mob to violently assault the innocent. Corey, you phony! You don’t care in the least about these victims. Just like you don’t care about the thousands that are being killed by opioids coming across the southern border or the millions of babies that are aborted each year, including those late term and after -birth abortions. You are just looking for some constituents to vote for you. Mr. Spartacus, you are a joke! Corey, why don’t you concentrate on what really is killing in the world. How about you and your fellow DEms who champion infanticide? You won’t do anything to protect an unborn baby but you will do everything to save an endangered insect. You and your Dem friends suffer from a mental illness called liberalism. “black males make up a majority of homicide victims”, AND a majority of homiciders, since 97% of the time a black male is killed it’s by another black male. It’s more difficult to get a gun now than any time in history, yet gun crimes are up? It’s not the guns it is the people. The gun free zones are where these mass shootings are happening. They have NO desire to solve these problems, because it goes to their job security. Cory Booger = NASTY dangerous RACIST. 2017 Murder statistics: Planned Parenthood – 328,348. Those murdered by NRA members – 0, zero, nada, zip. 2017 Murder statistics: Planned Parenthood – 328,348. Those murdered by NRA members – 0, zero, nada, zip. Bring it on, Booker.